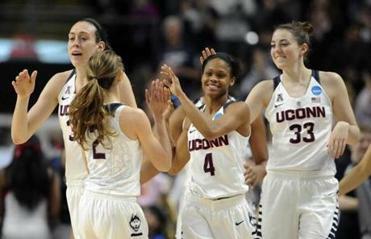 UConn players Breanna Stewart (left) and Moriah Jefferson (right) celebrated with Morgan Tuck (center) after the Huskies clinched their ninth consecutive trip to the NCAA Women’s Final Four. FORT MYERS, Fla. — It’s not because they win championships every year. We love dynasties. It’s not because they are female athletes. We love women’s sports. It’s because they have no competition. It’s the margins of these victories. The defending champion University of Connecticut women’s basketball team is virtually never tested. They seem to win all their games by 40 points. This is not UConn’s fault, but it’s also not good for the promotion of women’s basketball as part of our national sports landscape. Competition is why we watch sports. Who is going to win? Without that drama, sports would be no different from the theater, ballet, or symphony. The UConn women are so good they have stripped their sport of all drama and competition and made it similar to performance art. This is good for the game? Coach Geno Auriemma dismissed talk about the Huskies’ overwhelming victories being bad for the game. So there I was, early Saturday afternoon, sitting in my sweet hotel room near the Red Sox spring training complex, banging out a column for our always-spectacular baseball special section. I never work in silence in hotels. ESPN usually keeps me company. The white noise of “SportsCenter” is the soundtrack of my road life. On Saturday afternoon, the Worldwide Leader was bringing us a UConn-Mississippi State Sweet Sixteen basketball game. I was certainly aware that the Huskies had won a million straight games, most of them by 40 or more points, but I was interested to see if maybe they’d get a challenge since it was the tournament and all. Nope. This game was a joke right from the jump. UConn bolted to a 13-0 lead, and every time I looked up at the TV, the score was worse. It was 32-4 at the end of the first quarter. Then 61-12 at halftime, and 84-20 at the end of three. The final was 98-38. A Sweet Sixteen game. I know there is a legion of UConn women’s basketball fans out there, but I fail to see how they can be thrilled by games like this. Isn’t competition the very essence of sports? That was it. I went to dinner and didn’t think much of it. Whoa. Husky Nation was not happy. My Twitter feed and e-mail box were peppered with angry UConn fans. Fortunately, I’m used to this. I cover the Patriots and the Red Sox. Hell hath no fury like a Deflategate fanboy scorned. At least that’s what I thought before UConn coach Geno Auriemma returned fire Sunday. “When Tiger [Woods] was winning every major, nobody said he was bad for golf,’’ said the coach. “Actually he did a lot for golf. He made everybody have to be a better golfer. Good one, Geno. And so very true. I have spent thousands of hours watching women’s sports, and enjoyed every minute. My sister was a three-sport athlete in high school and devoted her professional career to teaching and coaching scholastic basketball, softball, and field hockey. Both of my daughters made Division 1 softball teams as walk-ons. One of them coaches high school volleyball and softball in the Bay State League. My niece was the 11th-ranked tennis player in the world and played on the tour for 15 years. I know that high-level women’s basketball often has better flow, more passing, more pick-and-rolls, more filling-the-lanes than the men’s game. It’s the basketball Red Auerbach taught us in the 1950s and ’60s. 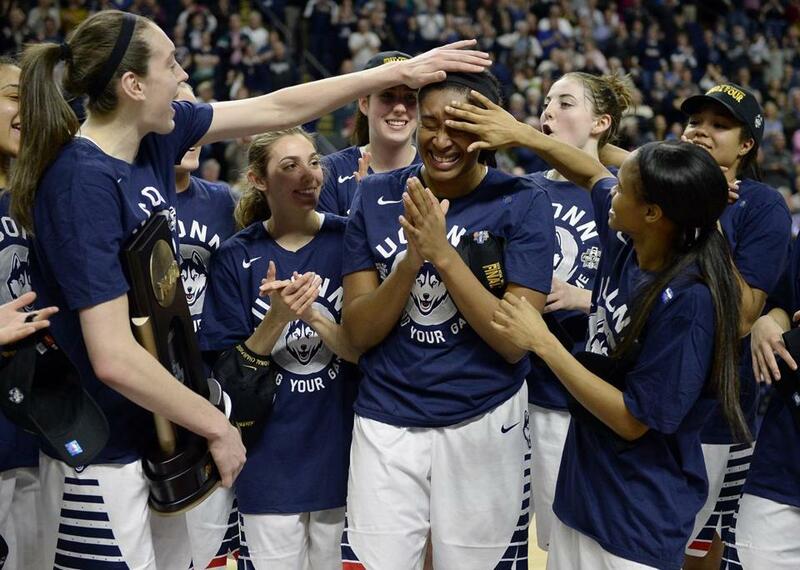 The UConn women play it better than any team in history. And they demonstrate great sportsmanship in the process. They even go to class and get good grades. It is not their fault that they are the best. They play the game correctly and they win. But I still believe that this kind of dominance is bad for the sport. It’s not just the winning. It’s the margin of wins. They simply have no competition. The games are almost never close. Geno and UConn fans need to stop comparing this to Tiger Woods or the Warriors of today or the Celtics of the 1960s or the UCLA Bruins of Alcindor and Walton. This is not like that. Those teams and individuals had rivals. They had to win close games. The outcome was often in doubt. Lew Alcindor’s UCLA team lost to Houston in the Astrodome, then came back to rout the Cougars in the NCAA Tournament. The Celtics would fall behind the Royals in a series, then roar back to win. Tiger didn’t win every golf tournament by 20 strokes. The Warriors are not 72-0. They don’t win every game by 40 points. UConn has won 73 straight. This comes after a 90-game win streak. On Monday night, they beat Texas, 86-65, in an Elite Eight game. UConn beat Texas by 51 points in the Sweet Sixteen last year. This year, when the Huskies led by 23 in the second half, it seemed like triple overtime. Here are some scores from UConn’s 36-0 season: 100-56, 79-31, 104-49, 96-38, and 107-45. In their first three tournament games they won 101-49, 97-51, and 98-38. Of UConn’s last 121 wins, 120 are by double digits. Their average margin of victory is 40 points. Again, this is not UConn’s fault. But is it really good for the game? It can’t be good for ESPN. The network folks know 98-38 is a ratings killer, so now they are fanning the “too good for the sport?” theme and coloring it as sexist in an effort to create outrage to make folks watch their unwatchable UConn games. Sports don’t grow in popularity unless people watch them on TV, and I don’t know a lot of sports fans who enjoy 98-38 in a tournament game. The Huskies have no competition. Sorry, but how can this be a good thing for women’s basketball?